Thanks to Fr John Walls SM, for this summary of his eulogy. So, Anthony Kelleher entered the Novitiate, and was professed, taking the name Raymond. After a short stint at Greenmeadows he joined the building crew on the chapel at Futuna Retreat House in Wellington. His stories of working with other Brothers and with architect John Scott were numerous. Ray returned to the seminary at Greenmeadows to work in the cellars as an able, fit and willing worker. He also undertook a Certificate in Science. His keen interest in tramping and breathing the mountain air was fostered at this time. Sunday trips took him up the steep side of Te Mata Peak, and the occasional trip into the Mt Aspiring area. Then a significant change, - to the teaching staff at St Patrick's College, Silverstream. Here he flourished, as a teacher, dormitory master, administrator of the Duke of Edinburgh Award Scheme, coach of athletics and harriers and Master of the boys’ dining room; a multi-talented man involving himself in the midst of pupils' many activities. As importantly, he was an excellent community man, willing and kind and ready to muck in. His next appointment for almost 15 years, was to St Patrick's in Timaru, finishing as it was joined with Mercy to become Roncalli College. The Roncalli magazine mentions his generosity in the use of his time and talent which bore much fruit. The building of the Science Block, Admin and new Chapel, and later the refurbishment of classrooms, were under his management, which occasioned at times, insightful changes to the architectural plan. Again, he was fully involved as a teacher, retreat organiser and manager of the yachting team. There was also a personally sought donation from Sir Michael Fay of one yacht! 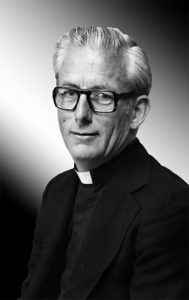 Ray was then invited to put his talents more directly at the service of the Society of Mary as manager and bursar of the Mt St Mary's Theological College in Auckland. “That's a left field job” he commented when asked to take on the position, but of course, he accepted - and found himself manager of the budget, the office, the accounts, the security, liaison with the landlord and other tenants and the Greenmeadows Mission Trust Board, as it was then. He had a profound ability to think and plan ahead. He identified key advisors and built excellent relationships with them. Ray was a passionate and fierce champion of the place and status of our Brothers - not just verbally, but in his life and attitude and willingness to engage others. He took care of the inner man also - three times engaging himself in the Ignation Exercises and deepening his relationship with the Almighty. Thus he caught a new Bishop's eye- and so Bishop Stu O’Connell SM, remembering his confrere from earlier days, asked the Provincial if Ray could come to the Cook Islands to be his Clerk of Works. Ray accepted this new challenge. However, his mission plans were almost stifled when he arrived at the emigration gate with a passport which was almost expired! Ray's practicality and ingenuity were everything that Bishop Stu needed … which resulted in a rebuild of St Joseph's primary school, and five new classrooms at the high school - Nukutere College. Bishop Stu remembers Ray being on hand to welcome the first load of bricks - vibrapack blocks. He took a screwdriver to the first brick, successfully dismantled it, and sent the whole load back!! Ray also reinstated the Catholic Education Board there, deliberately befriending the folk who had the skills he thought he needed, before asking them to take up the position. Again, his energy and adaptability, and ability to engage won the day. Ray loved his time in the Cooks - and the quirks of living there. He said it was the only place in the world that you knew the score of a Super 12 rugby game 24 hours before it was played! On return to NZ, he joined the Aro Valley Community and took up the coordination of the newly formed Network of Marist schools. Not only were his administration skills utilised but he was also a strong and cheerful support to those who worked with the various school groups. He strengthened the Network, established a trust to ensure some financial support, and maintained a lively and personal interest in the welfare of the schools. 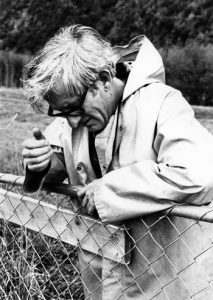 He was and is a very close friend - a teaching colleague, fellow tramper and wanderer, a traveller with school trips and superb organiser of anything that meant heading for the wild country. Moments shared on a mountain top, or in an alpine or tramping hut at night, on a river, mountain biking in the headwaters of the Clarence, or on Lake Wakatipu, or with a load of boys in a van about to run out of petrol, or waiting to be hoisted onto an Air Force Iroquois from the headwaters of the flooded Wilkin River .... he was often the one who would say stop - look, isn't that the work of a very imaginative creator! Ray could be sharp and definite in stating what he believed, and any listener would know what was on his mind. Perhaps, though, it was one of Mary's last gifts to this very practical Marist, that having accepted his imminent death, Ray quietly went about handing his life over to his Creator, gently quietly and without fuss - not an ordinary life at all, but it seemed to be. Immersed in whatever he was invited to do, enjoying it, engaging with those also involved. He lived life to the full and enjoyed doing so.